Graham Attwell, Pontydysgu, UK from Web2LLP on Vimeo. One of those resources is a video gallery including interviews with project managers who have used social media in European Commision sponsored Lifelong Learning Programme projects. Over the years I have had a fair bit of interest, in this diagramme, produced in a paper for the the e-Portfolio conference in Cambridge in 2005. As I am working with learning eportfolios, with web 2.0 tools, networking is a learning process for my students. Therefore, they are building their networked self. So, if I argue networking is an eportofolio process of web 2.0 eportfolios, who owns the process? Looking at your article and your illustration, I thought it could be a process owned by both the learner and the external world. If networking is a process of sharing, visiting, linking, connecting, commenting, does it mean that it involves both the learner and the audience? this is what I thought before you told me that it is the learner’s process for sure. So do you think that definitely I should argue that it is only owned by the learner? Then although it could need someone else to comment and connect, in fact, the act of networking is the student’s responsibility? is this the reason why you think that?, do you think I should argue it is owned by the learner? These are interesting discussion impacting on wider areas than ePortfolios. In particular I think the issue of control is important to the emerging MOOC discussion. Returning to Gemma’s questions – although I have not read the paper – I don’t think I agree with Cambridge’s idea of he networked self and the symphonic self – at least in this context. I think that networking becomes more important when presenting learning, reorganizing learning, linking learning evidence, and longer and more profound reflection. these processes are inherently social and therefore take place in a social environment. However it is interesting that social networking was hardly on the radar as a learning process in 2005. And when I referred to the ‘external world’ I was thinking about external organisations – qualification and governmental bodies, trade unions and employers rather than broad social networks. Probably the diagramme needs completely redrawing to reflect the advent and importance of Personal Learning Networks. One of most interesting outcomes of the study was the relation between control and ownership. The results show that while perceived control of intangible aspects of a learning environment (such as being able to determine the subject matter or access rights) has a much larger impact on the feeling of ownership of a learning environment than perceived control of tangible aspects (such as being able to choose the technology). Personal Learning Networks are possibly the most important of the intangible aspects of a learning environment. 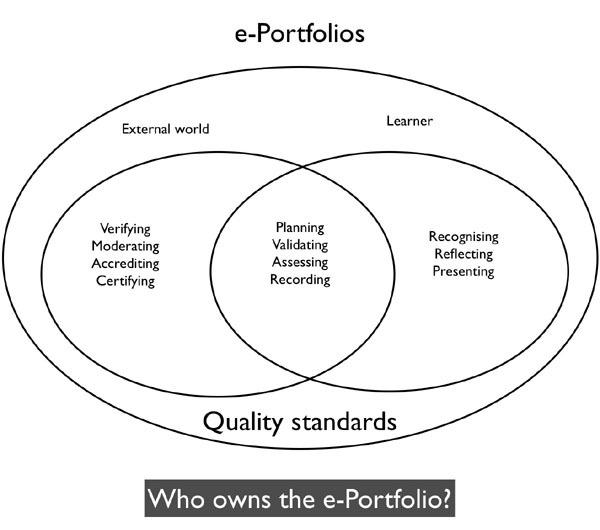 The development of PLEs (which I would argue come out of the ePortfolio debate) and the connectivist MOOCs are shifting control from the educational institutions to the elearners and possibly more important from institutions to wider communities of practice and learning. Whilst up to now, institutions have been able to keep some elements of control (and monopoly through verifying, moderating, accrediting and certifying learning, that is now being challenged by a range of factors including open online courses, new organisations such as the Social Science Centre in Lincoln in the UK and Open Badges. Such a trend will almost inevitably continue as technology affords ever wider access to resources and learning. The issue of power and control is however unlikely to go away but will appear in different forms in the future. How to classify and search careers resources? the problem with any such site is how to classify information and even more so how to make it searchable. Yes tag clouds help. And of course you can search by keywords. But when we are talking about careers (and many other topics – for example Open Educational Resources) it is not so easy. On the one hand there is the need to make specific information easily accessible, on the other hand the aim to let people explore options they might not have thought of. And of course much depends on qualification requirements. My own very limited research found that most young people do not go to official careers resources but just enter search words into Google – with very variable results.Furthermore, they seemed to have a limited ability to judge the varci8ty or authority of search returns. In response to a major piece of user testing and feedback earlier in the year, conducted for us by the International Centre for Guidance Studies at the University of Derby, we have completely revised our homepage, changed the structure of our content and made our functionality more explicit. This will make it easier for our users to personalise icould content, search out what is important to them and find what they need to inspire the next step on their career journey. As always, we welcome your comments and suggestions for further improvements and are grateful for your links, tweets, likes and recommendations. What types of job are you interested in? What subjects do you study, or enjoy most? What type of company would you like to work for? What kind of working lifestyle would suit you best? It came up with probably too many results. but they were genuinely career directions I might have been interested in. And I far prefer this broader exploratory approach to many of the very dubious psychometric tools on the market, which seem to provide all kinds of strange results based on algorithms which make a lot of assumptions around our lives and interests which might or might not be true. Posted in careers, G8WAY, transitions, Wales Wide Web | Comments Off on How to classify and search careers resources? When I was at school, I never had a Saturday job, or even a paper round, although many of my friends did. My parents were afraid that working would interfere with my education. But I did work in the summer holidays and after leaving school worked for a year before going to university. And I think I learned as much working as I ever did at school. Indeed, the importance of work experience was shown up in our European funded G8WAY project on school to work and university to work transitions. The Guardian newspaper has drawn attention to a study by the UK Commission for Employment and Skills (UKCES) on part time jobs. The lack of opportunity for paid work is preventing young people becoming independent and in many of the case studies we undertook through the G8WAY project, resulting in considerable family tensions. And there is an irony here. At the very time young people are being denied the right to work, employers are increasingly demanding work experience, as a precursor to employment. The result is that many young people are being forced to undertaken internships, either at a low pay rate or even without pay. That such internships exist, suggest that there are jobs. It is just employers do not want to pay. Since I wrote my last article on ‘What is the answer to youth unemployment?‘, elections in Greece, France and Germany have seen a decisive rejection of European austerity politics. This is hardly surprising. It doesn’t take a genius to work out that ever deeper cuts and austerity, whilst ultimately cutting the real cost of labour and thus boosting corporate profits, are unlikely to boost growth, jobs or individual prosperity in any way. The EU reaction has been to call for a new strategy for growth, although details of what that might entail are pretty hazy. As I wrote in the previous article, one of the main results of the recession has been a massive increase in youth unemployment and, in particular, a substantial increase in graduate unemployment. At the same time companies are increasingly requiring work experience prior to employment resulting in increasing pressure for new graduates to undertake low paid of unpaid internships. Pretty clearly new policies are needed for education and training but there seems little public discussion of this, let alone of what such policies might be. The prevailing EU policy is more of the same and try harder. To rethink policies for education and training requires looking back at how we got where we are now. And it requires looking at more than just education and training policy – we need to examine the relationship between education and training, labour market policy and economic policy. here I am going to look at just a few aspects of such policies and hope to develop this a little more in the next week or so. For the last decade – or even longer – economic policy has been driven by a liberal free market approach. In turn labour market policy has similarly been based on deregulating labour markets and removing protection for workers (interestingly, Germany, the one country in Europe where the economy is growing, has probably one of the highest levels of labour market regulation). At a European level, education and training policy has been dominated by a drive to make qualifications more transparent and thus comparable in order to promote the mobility of labour. Employers have been given a greater role in determining the content and form of qualifications. Employability has become a key theme, with individuals being made responsible for keeping their knowledge and skills up to date, often as considerable personal expense. A number of countries have tried to liberalise education and training systems by reducing subsidies for public education and introducing individual voucher schemes. Much of the initial theorizing about the advent of a fundamentally new era in which economic activity is increasingly ‘abstract’, i.e., disconnected from land, labour, and physical capital (machines and industrial infrastructure) was associated with the ‘business management’ literature of the ‘new economy’ NASDAQ bubble, which collapsed in 2001 (but slowly recovered, albeit, in a leaner format, throughout the 2000s). This literature was initially known more for its hyperbole and faddishness than for its academic/empirical integrity. In reality, many of the new degree courses were vocational in orientation – such as in the new Universities in the UK or in the Fachshule in Germany. These courses were either for new occupations – for instance in computing or simply replaced traditional vocational qualifications. It is arguable whether such a policy was financially sustainable or even desirable. It is certainly arguable whether an academic programme of learning is more effective for such subjects than traditional forms of work related learning. To further policies associated with the obsession with the knowledge economy were the raising of the school leaving age and the so called lifelong learning policy. Longer schooling was needed, it was argued, to cope with the needs for higher levels of knowledge and skills for the knowledge rich jobs of the future. And lifelong learning was needed for the learning economies in which knowledge is the crucial resource and learning is the most important process. At them same time the EU and national governments identified a number of key sectors which were felt to be crucial and which were then promoted through he education systems. In the late 1990s, there were dire predications of a massive shortage of computer programmers which never came to pass. And in the last five years or so EU and national governments have promoted the importance of STEM subjects – Science, Technology, Engineering and Maths as key to the future of employment and economies. Such priorities were based on a business driven policy of skills-matching promoting the “involvement of businesses in forecasting skills needs, through an employers’ survey tool and qualitative studies on the skills needs of business” (EU New Skills, New Jobs policy). It is clear such policies have failed and exhorting governments and agencies to try harder will go nowhere. What is needed is a fundamental rethink. As Professor Phillip Brown points out, the Lisbon Strategy was based on the idea that the technological lead then enjoyed by advanced industrial economies would be maintained with an increasing polarisation between highly skilled and well paid jobs in those countries and low paid low skilled manufacturing jobs being undertaken in developing countries. For a variety of reasons, including rapid technology transfer and a massive expansion of public education systems in countries like China and India, this hasn’t happened. Indeed it may be the very manufacturing sector which was downgraded by EU policy which is the future for jobs in Europe especially in Small and Medium enterprises. For all the talk of high tech, knowledge based jobs. The construction industry is the biggest industrial employer in Europe with 13,9 million operatives making up 6,6% of the total employment in EU27. In addition it has a substantial influence on other industries represented by a multiplier effect. According to a study by the European Commission, 1 person working in the construction industry is responsible for 2 further persons working in other sectors. Therefore, it is estimated that 41,7 million workers in the EU depend, directly or indirectly, on the construction sector. Out of the 3,1 million enterprises 95% are SMEs with fewer than 20 and 93% with fewer than 10 operatives (pdf file). And manufacturing makes up almost 25 percent of the German economy, as opposed to only 11 percent in the United States. German mittelstands – small, family-owned and mid-size manufacturing companies – are key to the manufacturing sector. Rather than relying on university graduates for skills and knowledge, the mittelsands tend to employ graduates from the Dual apprenticeship system. Indeed, many countries are promoting apprenticeships as one way out of the present mess. The present English coalition government boasts of the increase in the number of apprenticeship places. But in truth most of these places are apprenticeships only in name. The supermarket chain, Morrisons is the largest apprenticeship provider in the UK with many apprenticeship consisting of short induction training courses. To deliver the skills and knowledge for workers in a manufacturing economy through apprenticeship requires high quality training and the active involvement of employers and train unions alike. Moreover it requires social (and financial) recognition fo the value of apprenticeships. that seems a long way away. To overcome the present crisis of youth unemployment requires a series of radical and interlinked policy initiative involving economic and labour market policies rather than just tinkering with education and training curricula. At a macro econ0omic level it means developing manufacturing industry rather than merely relying on financial services and the high tech knowledge industry sector. It means making sure companies provide high quality training, rather than forcing individuals to be responsible for their own employability. It means making sure that those who have gained vocational qualifications have opportunities to use those skills and knowledge and are properly rewarded for their learning. It means freeing up capital for starting small companies. It means proper financing for vocational schools and providing alternatives to young people rather than just more school and expensive university courses. It means abandoning skills matching and planning for future societal skills needs. In other words we have to abandon liberalisation and free market ideologies and to recognise that economies and employment are a social function. As such society has to plan for the future of employment and the provision of jobs for young people. Is this too much to ask? the last three months have been pretty hectic. So much that I have been somewhat lackadaisical in posting on this blog. Partly it has been due to the sheer volume of work and also traveling so much. For some reason I always find it difficult to blog when I am on the road. Another reason is that a lot of the work has been developmental and has naturally generated a series of notes and emails but little writing. Its time to make amends. Most of the work supports both face to face and online learning. However we have been looking hard at how learning and knowledge development is socially mediated in different contexts. Over the last year we have been working with a series of ideas and applications for using open data for careers guidance. Supported by the Mature-IP project, by Careers Wales and Connexions Northumberland and more lately UKCES, we have been looking at how to use open data around Labour Market Information for careers advice and guidance. Needless to say, it has not proved as easy as we thought, raising a whole series of issues around target users, mediation, and data sources, data reliability and data interpretation, amongst others. We have encountered a series of technical issues but these can be overcome. More important is understanding the social uses of open data for learning and decision making which is much harder! The original idea of Webquests was based around a series of questions designed to encourage learners to search for new meaning and deeper understanding using web based tools and resources. Although Webquests have been used for some time in schools and colleges, we have been working to adopt an updated Webquest 2.0 approach to the needs of learners in Small and Medium Enterprises. These inquiry–oriented activities take place in a Web 2.0–enhanced, social and interactive open learning environment (face to face and/or on–line) that combine at the same time collaborative learning with self–paced learning. Once more, this work has posed a series of challenges. While we have been pretty successful in using webquests 2.0 with SMEs, it has proved harder to enable practitioners to develop their own online learning materials. We have been continuing to explore how to use technology to support work based learning and in particular how to use mobile technologies to extend learning to different contexts in Small and Medium Enterprises. We are especially interested in focusing on work practices and how technology can be used to support informal learning and practice in the workplace, rather than the acquisition of more formal knowledge. In order to finance this work we have developed a number of funding applications entailing both background research and (more enjoyably) visits to different companies. We are fairly confident that we will get support to take this work forward in the near future. We have been looking at how to use social media and in particular internet radio, not for promoting social inclusion, but for giving a voice and opportunity for expression to those excluded form access to traditional education and media. Once more, we are confident that we will be able to launch a new initiative around this in the next couple of months. We will be publishing more about this work over the next couple of weeks. If you are interested in any of these ideas or projects please get in touch. The debate over computer science, digital literacies etc. in the UK is still continuing. And the success of the Raspberry Pi computer – selling out of its first 70000 production run in under a week shows the demand and interest in coding and computers in general. One driver of the debate is that employers are unhappy with the competence and knowledge of potential employees. But this is not new. Employers have always moaned that job applicants do not have the right skills, aptitudes, attitudes – whatever. And it is always the fault of the schools or universities. Maybe it is time that employers started thinking about their own role and responsibilities for training a future workforce. And that includes the IT industry. Of course curricula need updating. Learning how computers work is probably more of a democratic necessity rather than for employment or the economy. There is a danger that we evolve as a society of consumers essentially controlled by the technology of a few major corporations. You know who they are! But just tweeking the school curriculum or weeding out production fodder university courses will not solve the problem. The real issue is how we view learning – how we create learning environments outside the classroom and how we value learning that takes place outside the formal education sector. Secondly, there’s a spectrum of challenges, but there’s also a spectrum of solutions. It’s not just schools and universities that need to bear the burden. As I said, coding is a practice. There’s only so much that can be taught; an incredible amount of my knowledge comes from experience. Practical projects and exercises in school or university are essential, but from my experience, none of that can beat having to do it for real. Whether it’s for a living, or in your spare time (coding your own site, or taking part in an Open Source project), the moment your code is being used in the real world and real people are bitching about it or praising it, you get a better appreciation of what the task involves. So it’s not just universities and schools that need to improve their schooling if we want to produce better coders. Employers should take a more open-minded approach to training staff to code – those that are keen and capable – even if it’s not part of their core competence. Technology providers should make it easier to code on their computers and operating systems out-of-the-box. Geeks need to be more open-minded and accommodating to interested beginners, and to build more approachable tools like Codecademy. Culturally, we need to be treat coding less like some dark art or the preserve of a select few. I spend a lot of time at the moment looking at how we can interpret and explain labour market data, especially for use in careers. Universities are a sensitive area of policy in the UK, and particularly in England, with an increase in fees of up to £9000 a year from this September. Inevitably, young people – and parents, are increasingly wondering if it is worth it in terms of future careers. Strangely the big fall off in applications is from mature students who will be less effected as many of them will not hit the ceiling for repayments of the students loans being made available to pay the fees. Thus, I suspect, it is perception rather than immediate hard economics which is driving people to apply or not. More than a third of recent graduates are employed in low-skilled jobs, official figures show. In the final quarter of 2011, 35.9% of those who had graduated from university in the previous six years were employed in lower-skilled occupations, the Office for National Statistics (ONS) said. This compares with 26.7%, or just over one in four, in 2001. In the same period, the number of recent graduates in the jobs market has grown by 438,000 to around 1.5 million in 2011. Jobs categorised as low-skilled by the ONS include hotel porters, waiters and bar staff, and retail assistants. The report may be masking the extent of graduate unemployment however, as the unemployed figure excludes those on work experience or internships many of which are short term and, controversially, unpaid. The one figure which surprised me in the video was the concentration of graduates in London and the South East. I suspect this reflects the role of the London and the South East as the centre for banking and finance, most of which jobs require a degree. Conversely those regions with a lower percentage of graduates are mainly focused on manufacturing industry. Whilst these industries require skilled workers, degrees may not be so important. I would be very interested to see a comparison between pay and employment of graduates and skilled workers (without a degree – for instance with an apprenticeship). Unfortunately the way in which The Labour Force Survey collects data around qualifications makes it very difficult to make any meaningful comparisons. Yet, especially for young people from working class backgrounds, that may be a key choice for them in coming years. And whilst the present English government is attempting to increase the number of apprenticeship places, there have been persistent criticism over the quality of those apprenticeship places (see this recent BBC report), with many so called apprenticeships consisting of short courses in the retail and service industries – just those very areas where so many recent graduates are ending up!